Following a proven approach to Radiation and Contrast Dose Management can help you achieve your quality goals. 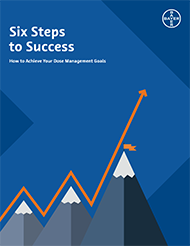 Our new, six-step guide is packed with practical, actionable advice based on real-world experience that takes you through critical points in your Dose Management journey. Hundreds of radiology departments like yours have already discovered how Dose Management programs can help them attain their compliance, quality and efficiency objectives. Download this report and join them.